The Waltz…Easy As 1, 2, 3! If you’ve read my post ‘Why Dance? It Doesn’t Take A Genius” then you already know that women love men who can dance…ask any of them. All cards on the table, the Waltz is a dance most men will do formally 1-2 times a year…maybe. Note that I said ‘formally‘… all circumstances are different. The Waltz is a dance most commonly seen at weddings, anniversaries or other formal events. Of course your career and/or social circles may expose you to more formal events than the average Joe. 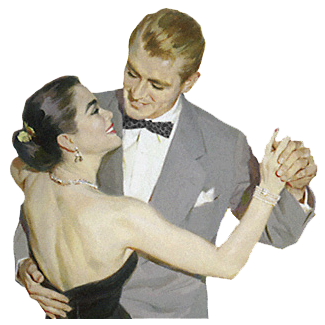 Regardless… if you know the timing and understand the basics, the Waltz is a dance you can do anytime, any place. It will draw envy from men and respect from women. Different dances are dependent on the individual song and that song’s timing. Would you know a Waltz if you heard one? Below is a short list of songs that are different speeds of waltz tempo. For those of you who are familiar with playing or reading music, the Waltz has 3 beats per measure (3/4) while most other music is 4 beats per measure ( 4/4). Only the waltz is 3/4, that’s what makes it unique. So to clarify, you can dance a Swing, Fox Trot, Cha-Cha, Rumba, Samba, Tango or most any other dance to a 4/4 song. But you can only dance a Waltz to a 3/4 music, and no other music will work with the Waltz ! Defusing a theory: I hear all the time “You can’t teach me to dance, I don’t have any rhythm”. This is nonsense and I’ll prove it to you. Do you have a heart beat? Does it beat to a rhythm or is it completely erratic? When you walk down the street, do you walk in a rhythm or do you stagger, stutter and falter down the street? Just stop for a moment…if you need to, get up and walk through the room. Both your heart beat and the stride when you walk are very rhythmic. You don’t think about it, you just do it naturally every day! Everybody has rhythm, some people just have a harder time consciously putting it to work. I chose to write this post about the Waltz because it is the same rhythm from which you walk. If you were to count up to 6 with each step you took as you walked down the street, it would not be “1….23…..4..5…..6” it would be “1…2…3…4…5…6”. ….That timing, that walking….That is the Waltz . Doing the Waltz is like walking down the street only you apply simple patterns. The timing and the rhythm remains the same as walking “1..2..3..4..5..6”. The simple pattern applied is what’s called the ‘Box’ step, because it looks like a square on the floor…or a ‘Box’. Just like walking, you step left, right, left, right, left, right. Also like walking you step in even tempo “1, 2, 3, 4, 5, 6″. At first it will likely feel stiff and not natural, but after doing it for 5-10 minutes straight, you will find it becoming more and more simple, more natural. After teaching this basic step I often hear the common statement…”This is not what it looks like when I see it on TV!”. This is true, and the reason for that is the turning. I would GREATLY encourage you to practice this step WITHOUT turning. Practice it just as you see, do it over & over & over again, until you feel it’s becomes ‘easy’. When is it ‘easy’ enough? When you can hold a conversation with another person while doing this pattern, then you’ve got it well enough to move on. The animation to the left shows the same box with no hesitation, as it should be danced. Immediately start a new box upon completing the previous. Turning The Box: Turning this simple box is likely not what you expect…you Do Not use your feet to turn the box. There is a surprising parallel between leading a woman on the dance floor and many sports. In boxing, the trick to a good strong hit is the utilization of your shoulders with your body weight. Similarly, when golfing or snowboarding, the trick to proper technique is the use of shoulders and manipulating your body weight. Dancing is the exact same idea. Always continue stepping in the pattern above, then start to turn your shoulders to the left very slowly. Let me emphasis ‘slowly’.. one box step will not even turn you 1/4 . You will be better off doing a couple box patterns without turning…then after 2 or 3 boxes, start turning your shoulders slowly to the left. Do not think about turning with your feet at all, your feet will follow your shoulders and the box will turn on it’s own. This is a baby step to the technique of leading a woman on the dance floor. Whether you choose to Tango, Swing or Salsa, you can lead most any woman with proper shoulder work (technically called FRAME). The Waltz is a great stepping stone to more complicated dances and a great way to learn the basics of leading a woman on the dance floor. This is where I’ll wrap this post but look forward to your feedback and I invite suggestions or requests. Why Dance? It Doesn’t Take A Genius! I’m a typical guy! I think Led Zeplin is the best rock band of all time, I drink beer, I watch football and my celebrity crush list includes Salma Hayek, Catherine Bell and Tanya Memme. I am fortunate however in that I learned something very early on…Women Love Men Who Can Dance! Knowing how to dance is like knowing several different languages. Most people understand Rock, Funk, Classical or Rap…but not many can also understand Tango, Waltz, Salsa or Swing. My Revelation: I was aproximately 15 years old and our school was organizing a dance in which parents where invited. Parent attendance was rare so they planned to have a Waltz contest for the … ‘old folk’. I had discovered the previous year that I liked moving around to music when a friend put on Midnight Star’s “No Parking On The Dance Floor“. I really had never heard this kind of ‘electronic funk’ before and it pretty much blew my mind. Aware of my newly found appreciation, my friend Lilas looks to me and says, ‘We should learn to Waltz for the contest’. Understandably, most 15 year old boys when confronted with a request to ‘learn the waltz‘ would tend to shy away, if not literally run away! Fortunately, my 15 year old, puberty bent mind processed the idea of spending time in close proximity with a pretty girl..and I accepted the challenge. Now I hardly remember the school dance, nor the contest. As a matter of fact, we may never have even attended. But I do clearly remember going to the library, finding an ‘Arthur Murray book of ballroom dance’ and learning the basic waltz ‘box step‘ with Lilas. **Did you know that when a guy knows how to do a basic waltz box step, there are ENDLESS girls lined up wanting to be taught?? This is something I learned almost immediately. After my schooling I ended up visiting one of those Arthur Murray dance schools in Orange County CA. The next 5 years found me teaching social dance professionally. Ultimately I grew tired of all the egos, boas and glitter and left…but the education was invaluable! Disclaimer: I am NOT telling guys to stop everything and walk into a dance studio… God No! I completely understand guys cringing at the thought of dance lessons. Shows like Dancing With The Stars don’t help matters at all! The representation of men who can dance in the media is piss poor. Guys, the reality is this…telling a woman you can swing or salsa has more effect than telling her you’re independently wealthy. Being lead around the dance floor is something very few women experience anymore…and women LOVE to dance. If you are secure enough with yourself to walk into a dance studio..do it! If you feel better with private lessons, there are plenty of teachers in most any city, simply ask their training. Most independent teachers did, at one time, work through Arthur Murray or Fred Astaire studios. Learn from books, learn from online videos. Learning the basic step patterns is important, but utlimately I recommend working at least a little with a female instructor to build your skills in ‘leading’. Waltz: the basic pattern is the same as the Rumba, just different rhythm. This Blog will be growing with actual instruction, please bookmark it for more later.